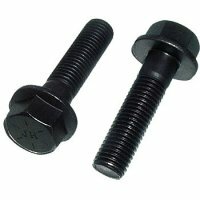 Flange bolts also known as frame bolts. Our hex head flange bolts are offered sizes : 5/16-18, 3/8-16, 7/16-14, 1/2-13, 5/8-11 and 3/4-10 with lengths from 5/16 inches to 3 inches. If you don't see the size you need or would like a different quantity, please call, we most likely have it in stock.